Not so very far away, in the department of Calvados, lies the little village of Vendeuvre. The village, 45 miles north of us, is unremarkable but the Château de Vendeuvre is notable in several respects. The Château of Vendeuvre was built in 1750 as a summer residence and it has been occupied by the same family ever since. The château is a superb example of a French stately home, among the few that has preserved its original furniture and decoration. The visitor has a choice of visiting just the gardens (the “surprise” water gardens, shell grotto, maze, tropical garden and formal park) or paying a couple of euro extra for a tour of the château and visit to the doll’s house furniture collection – reputedly one of the best collections of miniature furniture in the world, with more than 700 pieces of exquisitely detailed doll’s house and miniature furniture and thousands of other tiny reproductions. If visiting just the gardens, allow 2-3 hours. The price in 2009 is 6.90€ for adults. Tickets are purchased from the former orangery, halfway down the driveway to the Château. The long approach to the Château de Vendeuvre is lined by clipped yew topiary, whilst the orangery also houses the miniature furniture collection. Rounding the château by the steps to the right of it, the main gardens come into view. There are are three distinct garden areas: immediately behind the château, a landscaped garden in the formal French style with a lake, parterres and rose garden; to the left of that a labyrinthine garden which contains (amongst other unusual features) a Japanese tea house, a bizarre shell grotto and a small, walled tropical garden. Formerly an orchard occupied this latter area, but the trees were uprooted during the 2WW when it was requisitioned as a tank repair yard. The shell grotto, decorated by over 200,000 shells and with an underground fountain, was designed to provide shelter from the heat in summer. To the right of the château are the main grounds with the famous “surprise” water gardens of Vendeuvre – these are best approached down the alleyway past the remarkable dove house -at the end turn left at the pyramid-shaped ice house and cross the bridge. 1st May to 30th September daily 11.00h to 18.00h. October Sunday afternoons 14.00h to 18.00h. Located by the steps on the right as you round the Château of Vendeuvre are the gift shop (also sells drinks) and toilets. Next to the gift shop are the kitchens (worth a quick tour) and a strange collection of dog-beds, dog-kennels and dog-collars. We’ll be adding more gardens during the year, so keep reading! In the meantime, there’s a summary of the gardens near us on our B&B website Gardens of Lower Normandy and Upper Pays de la Loire. 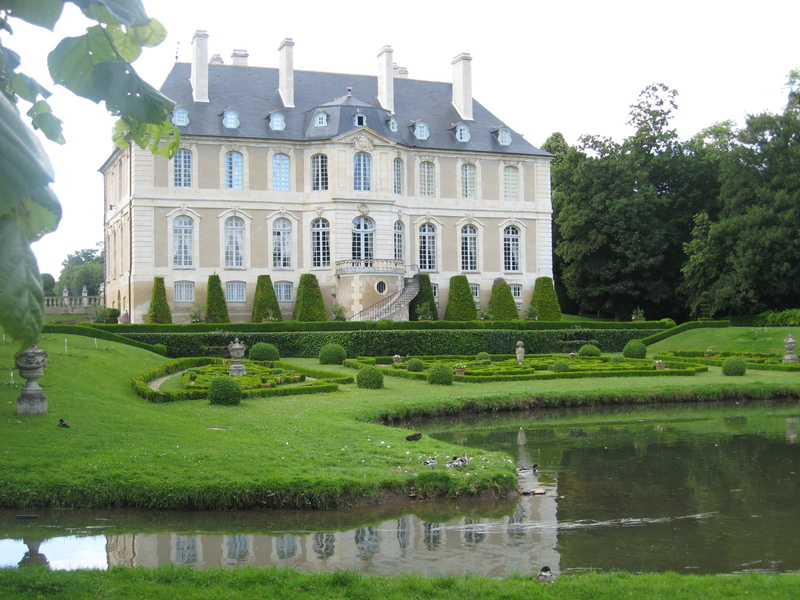 The gardens and Château de Vendeuvre are 80 minutes away – on our visit in June 2009 we also called at the Priory of St Michel at Crouttes (a small garden also open to the public) but we think a better choice would have been a visit to Camembert – which we’ll be doing soon. The Château de Sassy or Château de Carrouges would also make a good options, or a visit to the town of Vimoutiers or to Falaise (William the Conqueror’s home town and castle).